These Tortilla Roll Ups are What Must Be Served in Food Heaven! If you are having a party at home and are looking for some good appetizer ideas, tortilla roll ups are perfect. This write-up will give you some recipes to make delicious tortillas rolls. Tortillas are a type of bread which is flat and has a round shape. They are common in most of the American and Spanish speaking countries, it is most commonly linked with Mexican foods and cuisine. They are either made with corn flour or wheat flour and are used in dishes like burritos, tacos and enchiladas. One of the most common ways of eating it is by filling it with different types of vegetables, meat, and poultry, and then rolling it up. These roll ups are very popular as appetizers and are great for adult as well as kids' parties. 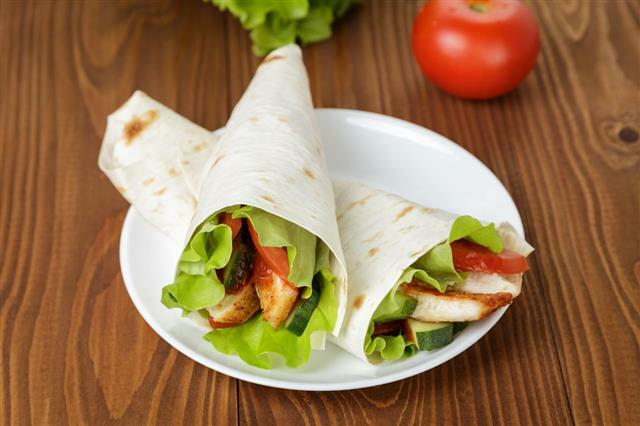 So, if you want to know the recipes of some delicious tortilla rolls, here are some of them that you can easily make at home. Take cream cheese in a medium-sized mixing bowl and add ranch dressing mix to it. Blend these ingredients with a spatula till they become smooth in texture. Once this is done, put in the celery, olives, bell pepper, ham, or beef and onions to the bowl and mix so that all these ingredients are thoroughly coated with the cream cheese mixture. Take a tortilla and spread ¾ cup of this mixture on it. Repeat the same process with the other tortillas. After filling them, roll them tightly and enclose it in a plastic wrap. Place these in the refrigerator for two hours and serve by chopping them into ½ inch pieces with a dip of your choice. In a mixing bowl, take cream cheese and combine it with mayonnaise. Next, add green olives and onions to the bowl and mix until thoroughly combined. Spread this filling into all the tortillas and place two ham slices on each one of them. Once this is done, roll the tortillas tightly and then chill them in the refrigerator. Once this is done, slice the tortillas into 1-inch pieces and serve. The first step would be to mix mayonnaise, black pepper, cream cheese, and mustard in a bowl. Once these ingredients are completely blended, spread it evenly on each tortilla. Place finely chopped chicken, onion, carrot, and bell pepper on the previous filling. Make sure that these ingredients are evenly spread on the entire tortilla. After this is done, roll up the tortillas and wrap it tightly in a plastic wrap. Allow it to chill in the refrigerator for several hours. At the time of serving, cut them into ½ to 1-inch sizes.